Last November, Street Plans' facilitated a Tactical Urbanism Materials Guide Workshop with the City of Fayetteville, Arkansas, designed to expand Fayetteville's familiarity and comfort with planning and executing collaborative demonstration, pilot, and interim design projects. The City was the third of six “Beta City” partners that Street Plans will work with as part of the Tactical Urbanist’s Guide to Materials and Design project. As a result of Street Plans' workshop, the City of Fayetteville installed a pilot mini-roundabout, in partnership with Travel with Care NWA. 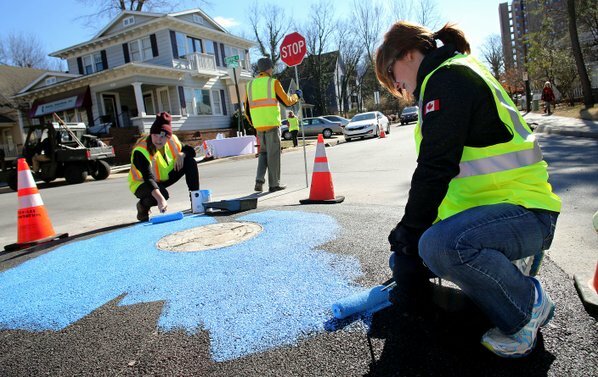 According to Dane Rifling, the Bicycle Programs Coordinator with the City of Fayetteville, the City doesn't always have the staff or time available to address residents' concerns, such as speeding or walkability in their neighborhoods. Tactical Urbanism provides a possible solution. The project is part of the larger corridor plan to link the Razorback Greenway with Fayetteville's Downtown square. The workshop explored a variety of intersection design options and bikeway treatments that can be delivered quickly and at a low cost. Check out a full article summarizing the Tactical Urbanism mini-roundabout HERE.